What do business get well cards have to do with pillows? 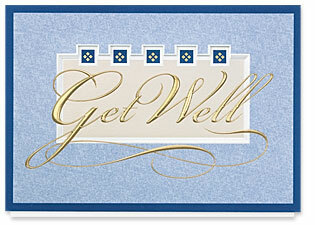 That thought crossed my mind as we were looking over the new 2009 get well cards designs this morning. 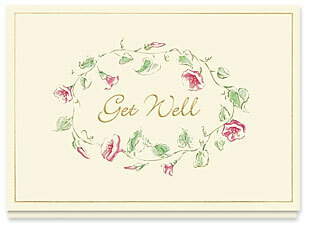 Design #115AY, Vintage Get Well Card, is a floral design reminiscent of years gone-by. One of my co-workers chimed in saying it reminded her of her favorite pillow called “Rosie.” Apparently, “Rosie” took her through good times and bad. Actually, some other co-workers remembered “Rosie” as Lindsey took her on a business road trip. That is one aspect of comparing get well cards to a pillow but when you think of it…if you are under the weather is there anything more welcoming than a pillow to lay your head down on or business get well cards received from your co-workers or business associates to cheer you up? Design #109AR, Wishing You Well Greeting Card, is another classic design that can be used to send your wishes to co-workers, family, or friends. It is a simple, stylish design that is sure to show your recipient that you care and you wish them well. The design is stylish but generic enough to send to anyone and is sure to bring warm thanks for your thoughtfulness. Many of us have spent time out of work nursing either an injury or sickness. When someone is not feeling well, opening a get well card and seeing that you are remembered by someone at work goes a long way to helping you recover.